Starring Agustín Rittano, Elvira Onetto, George Lewis, Julieta Vallina, and Maxi Ghione. A husband returns home to find his wife terrified to enter the bathroom because there are voices coming from the pipes. Voices promising to kill her. As she turns into a bloody human pinball, their entire neighbourhood turns into a giant paranormal freak show. Faced with these unearthly incidents and short on answers, a policeman calls upon two paranormal researchers to investigate. There’s something wonderful about seeing new monsters in horror movies, especially in an age where it seems like Hollywood has just about run out of fresh ideas. 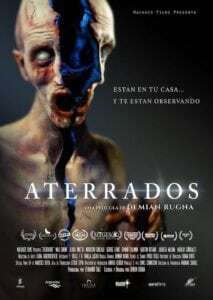 Because of this, when a movie like Terrified shows up, bringing with it a new monster apparently formed from various Argentine legends, it’s met with much deserved praise. The story follows two cops and two paranormal researchers as they investigate the cause of a young boy’s death, which they believed to be linked the death of a woman and the disappearance of a man. During the investigation, they find disturbing evidence of a supernatural force. The young boy’s body appears to reanimate, though no one ever sees it move, and there is video evidence of a tall, unnatural looking man hiding underneath the bed of the missing man. As the film progresses, more evidence of this sort comes to light, and the danger rises for the investigators. Though two of them are experts in the paranormal, they know no clear way of ridding the world of the entities they encounter, and their mission often feels hopeless. At only 87 minutes long, it is no surprise that Terrified is tightly paced. Never do five minutes go by without something eerie occurring, and even though the best scares occur in the first half of the film, the pace of the second half means the film doesn’t outstay its welcome, despite the waning impact of later scenes. There are a few production hiccups here and there. The subtitles clearly weren’t checked with a fine-tooth comb, as several typos and odd translations rear their heads throughout the film. Some of the more dynamic visual effects also look a little ropey. However, the creature design more than makes up for this lack of VFX clarity. Although Terrified doesn’t do anything to truly blow away audiences, it is a very effective and very creepy horror movie. There are some great, lingering shots, and the camera doesn’t shy away from showing you what you want (or, I guess, don’t want) to see. In short, it gets my seal of approval.